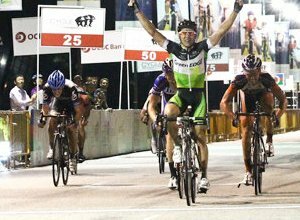 Cycling Southland's Tom Scully started his 2012 international campaign for his Chipotle-First Solar team winning the King of Sprints title at the prestigious OCBC Cycle Singaport Professional Criterium on Friday night. The race was held under flood lights on a 1.7 kilometre course around the Formula One Pit Building. Scully was part of a break which formed around 30 kilometres in to the race and then worked together well to stay away as they looked to position themselves for the US$12,500 first prize. In the final sprint Scully kicked hard for the win (and cash) but was passed by eventual winner Robbie McEwen (GreenEdge), Boy van Poppel (UnitedHealthcare) and Matthias Friedman (Team Champion System) to finish in a highly credible fourth spot. Scully had done enough during the race to pick up the most points on five designated sprint laps to earn a place on the podium as the King of Sprints. McEwen's victory continues a remarkable run for the 12-time Tour de France stage winner, having at least one victory in each of his 17 years as a professional. He said: "I had a feeling it would be a breakaway tonight and I had to be part of it. I had to ride an aggressive race — the six of us out front cooperated really well to keep us away from the pack." Scully is en route to Europe where he will spend a second season riding in Europe for Chipotle-First Solar Development team which acts as a feeder for pro team Garmin-Barracuda. 15 riders have been signed with the team in 2012 which will be based in France until later in the year. Pictured below: Tom Scully (third from left) is crowned King of Sprints. 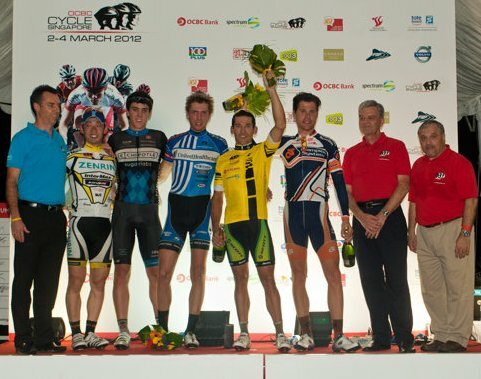 17 year ProTour veteren Robbie McEwen is in the middle in yellow.